Red Cherry Eyelashes ~ Evening Gown Ready Your special evening is soon approaching. Don’t forget to complete your look, with a pair of Red Cherry eyelashes, specially made for these exact moments. Glitzy glamour at your fingertips. These lashes will simply sparkle when matched with your pretty eyes. Utilizing our finest synthetic fibers, these lashes incorporate flashes of color over long, black lashes, that bring out your inner beauty. Worn with your new black dress, you’ll look simply astounding. Never too much, subtle hints of brilliance will shine from your eyes under the dimmed lighting atmosphere. The complete look is yours, and at the right price. We know you’re capable of making the right decision when it comes to deciding what looks good. 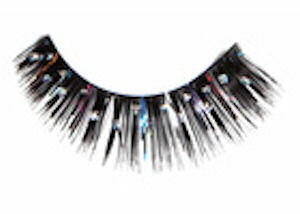 You can’t deny that these evening gown ready lashes wouldn’t compliment your beautiful black dress perfectly. Completely hassle-free when applying, you won’t have any problems in front of the mirror. Don’t forget your glue below.